08 God Gave Rock n' Roll to You III * (5:20) V.O.G. In addition to the musical content on " KISS Cover to Cover ", the CD also contains computer accessible bonus features. 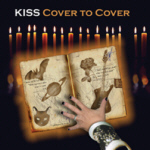 On the enhanced content of the "KISS Cover to Cover" disc, each song has its own page featuring info on the artist performing on the CD, as well as info on the KISS and original versions. The disc also features information about the cover design, as well as a message from the producer. * V.O.G. 's version of "God Gave Rock and Roll To You" doesn't sound similar to Argent's (original version) or the version Kiss covered, which made people think that the wrong track was added to the disc. "It's the correct track for the CD. We took submissions from various bands around the US. We were looking for interesting versions of the songs, as well as interesting views on the concept of the project. V.O.G. wasintrigued by the idea that KISS had changed the lyrics to the Argent version of the song, and added the "II" to the title. Taking the spirit of the song and the idea of numbered titles, V.O.G. re-structured the song entirely and added "III". The V.O.G. version of the song is in effect a "sequel" to the previous versions. Hope thats answers your question! !